How removing registration requirements helps to curb bike theft. Did you know that until November 29, 2016, everyone living in Oakland was required to pay $8 to the city to register every bicycle they owned? If you said “yes” then you can count yourself in the minority, as the city only processed around 100 registrations each year. Most people biked around, oblivious of this law, until an officer decided to stop and cite them for a violation. For the past several years we have been working with Oakland staff, elected officials, and Oakland Police to remove the bicycle registration requirement from the city’s municipal code, and instead promote free, optional registrations via online services like Bike Index. With the help of Oakland City Council President Lynette McElhaney this code change has now been approved. Why online registrations, and why optional? Before the internet was widely available, in-person bike registrations provided by local police or fire departments made sense. The registration created a record of your bike’s serial number and description, enabling the police to return the bike to you if it was stolen then recovered. However, these registrations were paper files, stored by the police department and accessible only to them. They also required individuals to know about the law, visit the police or fire department during limited office hours, fill out a form and pay a fee in order to process their registration. Nowadays we have great, free services like Bike Index, a national registry with over 100,000 entires and more than 3,500 recovered bikes confirmed. 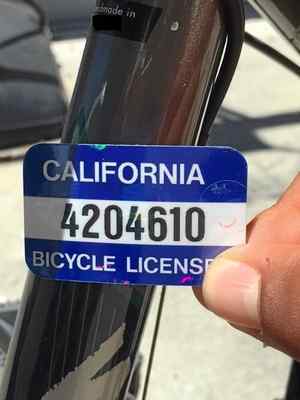 This bicycle registration is accessible online, so if your bike is stolen then recovered by a police department, bike shop, or some other good samaritan, even in another city or state, they can still look it up in the database and notify you through the website. This service is also free to the individual, and can be completed quickly and conveniently. Bike Index even provides point-of-sale plug ins for shops to register bikes automatically at purchase. It may seem counter-intuitive, but the end result is that by removing bike registration requirements and instead promoting free, optional services online, the number of people who register their bikes goes up and the cost to the city goes down (Oakland collected around $800 in bike registration fees but operating the program cost them just under $18k every year). What if I don’t live in Oakland? Lots of other East Bay cities still have old bike registration requirements in their municipal codes as well. We need your help to remove them, then promote and use free, online registries instead. Please review the list below, and email Education Director Robert (robert@BikeEastBay.org) if you can help us petition any other cities to update their ordinance. Click here to download the City of Oakland staff report with more details about how and why their bike registration requirement was removed.